ENCUENTROS/ENCOUNTERS CONCERT. 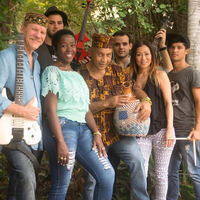 Pablo Menéndez & Mezcla: "The Sounds of Cuba Today"
CONCERT: Pablo Menéndez & Mezcla: "The Sounds of Cuba Today"
Under the direction of guitarist Pablo Menendez, Mezcla has been a part of the sound-track of the Cuban music scene for the past thirty years. Mezcla brings together several veteran masters with some the best of young players on the scene today. When at home in Cuba they perform regularly at Havana's premier jazz club La Zorra y el Cuervo and at the annual Havana Jazz Festival (Jazz Plaza). Mezcla's music is a genuine celebration of the culture and musical roots of the Pearl of the Antilles. A ray of Havana sunshine that inspired Carlos Santana to call them “the cleanest, freshest water I have ever tasted!" They have issued nine recordings. Their legendary 1993 release “Cantos”–re-released in 2014–featured the late Lázaro Ros, one of Cuba's foremost singers of Afro-Cuban Yoruba santería chants. Their CD "Akimba!," was pre-nominated for a Latin Grammy in 2002 and their 2010 release, “I'll See You in C-U-B-A,” (ZOHO), was nominated for the Best of Latin Jazz Awards as were several of the group's soloists. In 2014 Mezcla released live concert DVD “Pablo Menendez & Mezcla Todos Estrellas del Jazz Cubano” (Colibri) and in February of 2015 they released the CD “Pure Mezcla” recorded live at Yoshi’s jazz club in Oakland California during their 2013 U.S. tour. Mezcla’s animated videoclip “See you in C.U.B.A.”, created by Juan Padrón and Ernesto Padrón was a finalist in the prestigious Lucas Awards in 2016. Encuentro Cubano: the fifteenth in a series of annual Encuentros/Encounters at UCR, this annual event focuses on the music of Cuba with an evening performance by the Cuban band Mezcla on April 25. The conference on April 26 features presentations by leading scholars and performers from around the United States as well as Cuba.